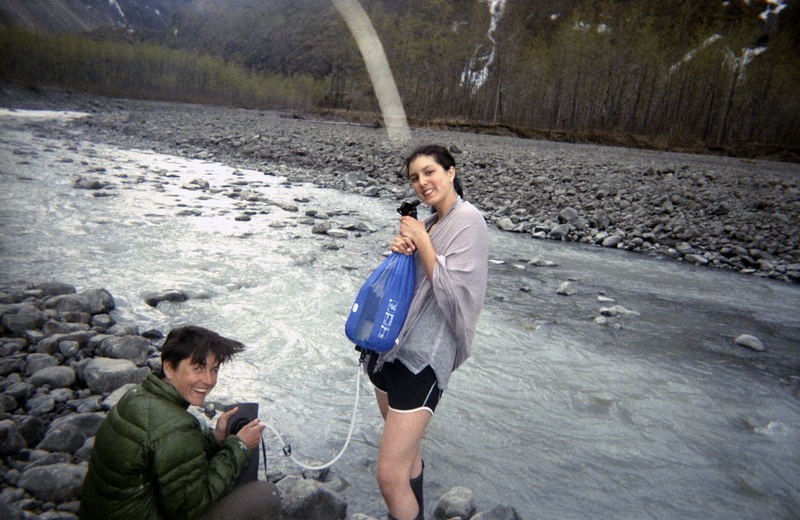 All photos taken with disposable cameras by Anchorage GRIT students. Thanks for developing them, Rue! The weeks fly by, the snow gradually melts and the miles rack up. We have lessons in bicycle maintenance, mapping, yoga and mountain bike skills. We work on custom panniers at Revelate Designs. We talk with former Olympian, Holly Brooks, about elite athletics and setting goals. We volunteer for The Alaska Botanical Gardens, Parks & Rec and Off the Chain Bicycle Collective. Every week the girls ride faster with more confidence. There were many falls and many questions and many challenges, but no tears. While riding trails in the Campbell Tract, two weeks before the Capstone Camp Out, we talk about our agenda. We give the girls two options for their final trip. The first option is to ride out 18 miles to the Beach Lake Lodge, spend the night at the lodge and ride back the next day. The second option is to ride out to Beach Lake, spend the night, continue 35 miles the next day to the Serenity Falls Forest Service cabin at the end of Eklutna Lake and ride 12 miles back to the trailhead on the third morning. They unanimously pick the second option– choosing to take on a huge challenge. 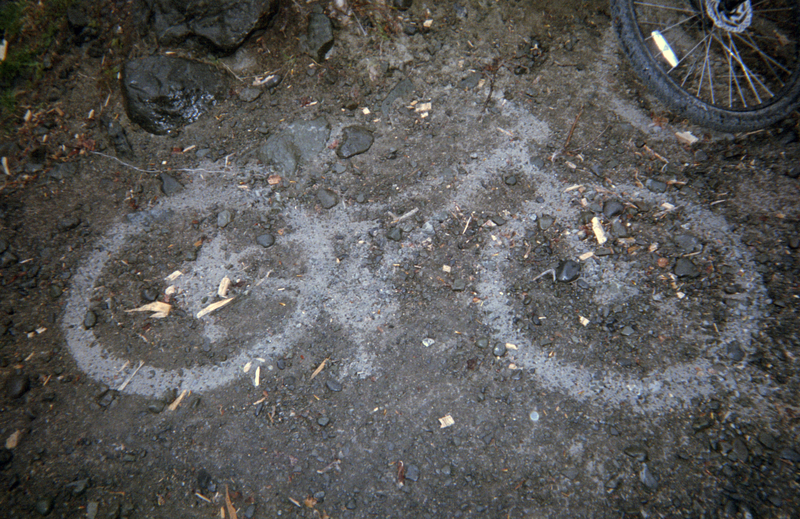 We make it clear that the Eklutna Lake ride includes an 1800′ climb. We want this to be a fun trip. The total distance covered is not the priority. I assumed they’d select the shorter distance and am surprised. The girls want a challenge and this is their trip. We meet on Monday of their final week for a packing class with Amy Breen. Amy, Cait, Lavanya and I arrive with loaded bikes. As a group, we ride to REI for the lesson. We talk about the gear that they’ll need for their final trip. The girls unpack our bikes and load our gear into their panniers and we go for test rides on the parking lot. The sun is out and energy levels are going through the roof. That evening, I go out for a shop ride with The Bicycle Shop. Around midnight, nearing the end of a 30 mile mountain bike ride, we hit a single track trail behind Earthquake Park. I’m riding pretty recklessly, excited by the long daylight and dry trails. At speed, I turn onto a narrow bridge spanning a muddy ravine and slide ride off of the bridge. I fall seven or eight feet straight onto my back. I’m screaming in pain and I can’t move and my mind goes straight to GRIT. Nick comes running down. He’s terrified. He’s yelling at me. I’m sobbing– both in pain and disappointment. This is not going to be a fast recovery. Nick helps me get up and pushes my bike back onto the trail. I get back on and ride five miles home. I strip out of my muddy clothes and pass out. The morning is rough. I can’t even put a t-shirt on and Nick has to help dress me. He’s pressed for time and has to get to work. He goes to the gas station and buys me 12 individual packs of Ibuprofen and a bag of ice. I really don’t know what to do. I take Ibuprofen and ice my back and text Cait to let her know what’s happening. I call my acupuncturist and I call my sister. She recommends that we go see her friend the chiropractor. Since I don’t have health insurance, this sounds like a blessing. She calls back minutes later. I start crying, overwhelmed by this kindness. We set up an appointment for that evening. I sleep through the afternoon and my sister comes to pick me up to take me to Jesse the chiropractor. He does some stress testing and says he thinks it may just be a muscular issue, but let’s take some X-rays just in case. The chiropractor takes an X-ray and finds two fractured ribs. He also finds a broken vertebrae, but that’s from a crash last year that I never got checked out, so it’s “healed”. He tells me that I shouldn’t ride my bike for two weeks. Most doctors would recommend to take six weeks off, but he knows that won’t work for me. There’s not much I can do beyond rest, ice and Ibuprofen. I know in my heart that if there’s any way that I can ride with the GRIT group, I will. The night is hard. I prop myself up on five pillows and try not to move. On Wednesday, Cait picks me up to drive to Begich. We’re all meeting there to pack up the bikes for the weekend ride. I tell the girls about my fractured ribs. We strap sleeping bags and sleeping pads to their racks with old bike tubes. We stuff their clothing and snacks into their panniers. They go for a short ride with all of their gear and we safely store the loaded up bikes in the Begich gym. On Thursday, Cait and I drive out to Eagle River to pick up the keys for the Beach Lake Lodge and grocery shop for the weekend. I am creaky, but determined. The lodge is spectacular, situated right on Beach Lake. It has a full kitchen, a loft and 2 small cabins. We got the go-ahead from the ladies at Parks & Rec to stock the fridge. We prep potatoes, onions and zucchini for tomorrow night’s dinner. I test out riding my bike up and down the street. For me, pedaling is like breathing. Even in pain, it feels so natural. I practice keeping my torso straight and stable. It rains all Friday morning, but clears up by the afternoon. Tamra picks me up and we drive over to Begich. As a group, we do some last minute packing and we’re out. The girls are so excited. Their big day has finally arrived. I ride sweep. We make a couple of packing adjustments in the first block and then we’re set. We ride the Glenn Highway bike path all the way to Chugiak, cross under the highway and take the Beach Lake Road to the lake. I’m surprised how easy and normal it all is. At the lodge, the girls’ unpack and Cait and I get dinner going. There is a burn ban in the Mat Su Valley, so we cook potatoes and hotdogs indoors. While we’re cooking, the girls write thank you cards to the sponsors and people that donated to the program. There are so many people to thank! We eat dinner by 8 o’clock and there are still hours of daylight left, so we go for a walk around the lake. My ribs ache, so I turn back early. The rest of the group continues around the lake to a path that leads to the Knik Arm. Back at the lodge, I sit on the steps with Lily, Natalie, Ella and Alyssa. I have to try not to laugh cause it hurts so bad, but they are just so funny. I am really going to miss these girls. All of the mentors are asleep much earlier than the girls. The mornings are the hardest. I wake up in fear, feeling like I’m not going to be able to get up. Once I do, the world comes back together. We make coffee and scramble 3 dozen eggs for breakfast burritos. The girls eat well. Hobbs meets us at the lodge with the mini school bus and we load it up with the rest of the food. It’s a three mile climb from Beach Lake back to the highway and then a climb to the Old Glenn Highway. The girls count down the miles. We’re 3/35ths done! 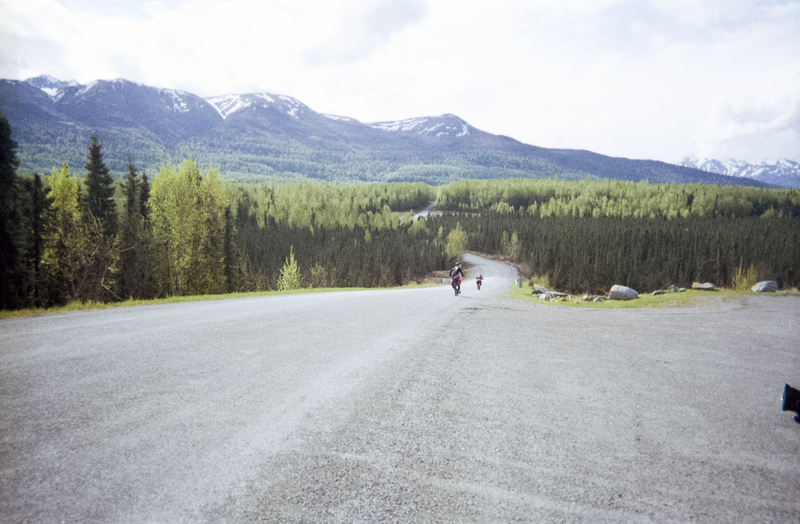 As a group, we make it to the base of the Eklutna Lake Road, where the 1800′ monster climb begins. I start with the first group of girls. It’s steep! The ten mile road is marked with mile markers. We take breaks every half mile. I promise that it’ll get better after mile 5 and it does. Waiting for the girls, I spot a woman in a car eating an ice cream cone. It’s always good to have something to look forward to. We climb a little more over the next mile and then it’s a descent all the way to Rochelle’s Ice Cream Stop. We stop and get cones and eat them in the sun on the green grass. It already feels like a distant memory. 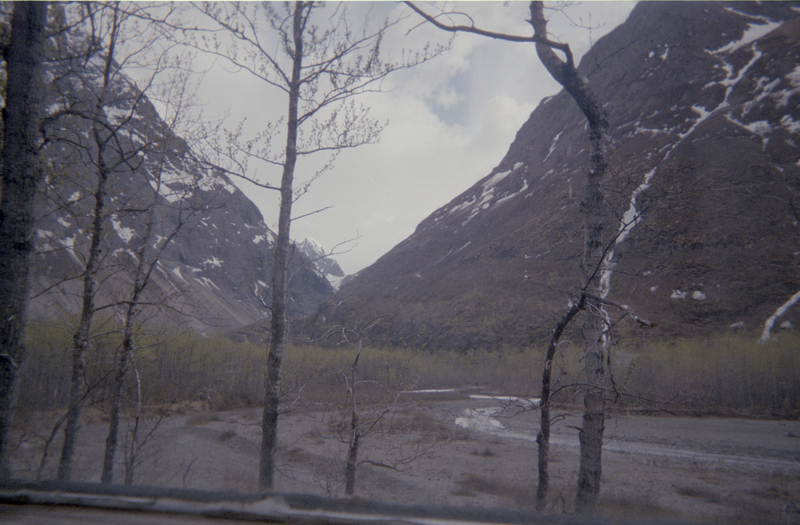 We descend another couple of miles to Eklutna Lake and Hobbs meets us there with pizza. It’s a twelve mile trail ride out to the Serenity Falls Forest Service Cabin. Cait takes sweep and hauls a trailer with a cookstove and dinner and breakfast. I take the lead and get out of the saddle every time I see a rough patch. I have a few moments of wrenching pain, but mostly I’m so focused on the girls that I don’t think about it. I am so impressed with all of the skills they’ve gained over the six week program. They are competent mountain bikers, taking on steep and loose climbs and descents. And we have a tailwind! We see Stephen Day, Duane and Dan out on the trail. They stop to give us Snickers Bars and gummy bears. We pass the lake at mile 8, then the airstrip and then a campground. The last two miles are really loose. Inside the cabin are cupcakes from Cody and Amy. Cody delivered them on bike the night before. Before doing anything else, we all sit and eat a cupcake and agree that they are the best cupcakes that we’ve ever tasted. Then, Cait gets the cookstove out to heat up pasta and sauce. I go to the creek with Alana, Anika and Alyssa to fetch water. We purify it through a gravity filter and bring it back to the cabin. We’ve eaten so well all day that we hardly make a dent in our pasta rations. There are bags and bags left of cooked noodles. We make a super hot fire outside and through the pasta in. It sizzles and burns. Girls play in the cabin and down by the creek. It’s awesome to have time and freedom! I’m whipped. I lay my sleeping pads out on a bench and carefully lie down. Anika comes over and tells me that I can sleep on her bunk. The bench is really narrow. She says she’s scared that I’m going to fall off and hurt myself even worse and then I won’t be able to bike back to the trailhead. She’s probably right. Her thoughtfulness melts my heart. I move my gear over to the bunk, spread out, slow my breath and fall asleep. It rains on the final morning. We drink coffee, eat overnight oatmeal and pack up. The ride back is mostly really fast. Near mile 5 we hit a narrow patch of single track. I don’t see her go down, but I see her and her bike on the beach. It’s Natalie. She’s way down there. We push her bike back up to the trail. She’s smiling, but she’s shaking and there’s dirt in her mouth and ears. This girl is so damn tough. We inspect her bike. She’s entirely broken her left brake lever off and cracked her grip. She rinses out her mouth and gets back on her bike and starts riding like it’s no big thing. Two miles later, Ella’s rack rattles off. We stop and bolt it back into place. And then we’re back and parents are waiting for us. We eat snack mix, and load bikes onto cars and hug each other and that’s it. 2017 Anchorage GRIT is over. I couldn’t be prouder of the girls– proud of their riding, proud of their great attitudes, proud of the kindness that they showed each other. Sometimes it’s hard, but if you keep pedaling, you’ll get there. Next year, we’re doubling the size of the program to include 4 middle schools in the Anchorage School District and 24 students. We’re inviting this year’s GRIT group to come back as mentors for next year. I can’t wait. Love the work that you do and enthralling enthusiastic evocation of cycling as both an adventure and enabling healthy life choice. OK, I’m crying now. Such a beautiful tribute to what you’ve done to make a difference. We all know these girls will never forget the adventure and some will most likely pass the torch onto others as the years roll by. Thanks to all of you for the initiative to get this program going. Thanks also to those who labored through cracked ribs, sore butts, greasy fingers, smelly hands, and financial support to make sure the girls learned their inner strengths. They know now how strong they are. Love that you put back so much Lael. And kudos to the sponsors for backing GRIT; great to see.